Group Price p.p. Price p.p. First and last night in Uganda not included. (including BB and airport transfer). Every Friday we have a departure! Ideal for a long weekend of adventure. If you have your own group or a romantic getaway for 2 😉 then you can choose your own departure date. Meet and greet the famous chimpanzees of Kibale National Park. Kibale Forest is one of the best places in Uganda to see wild chimpanzees. Thanks to habituation the chimpanzees lost their natural fear of humans and can be approached very closely. Kibale National Park is also a very good place to observe smaller primates like the black and white colobus, the red colobus, grey-cheeked mangabey and the rare l’Hoest monkey. Also nocturnal primates like the Thomas’s galago can be seen. Enjoy the beautiful scenery of Bigodi Swamp during a 3 hours wetland walk. 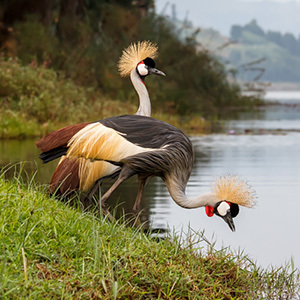 With over 200 bird species, 8 primate species, mammals like bushpig, bushbuck and the very shy and endangered sitatunga, many reptiles plus an uncounted number of trees, shrubs and vines, it is a wonderful place to be. What has this trip to offer? Staying in Kibale Forest Camp (part of Nature Lodges). You can choose “Lazy” camping (the tent is ready and fully equipped, showers and toilets are shared) or a room in the Lodges. All accommodation is on BB basis. All transport is in 4WD Landcruisers with a pop-up roof and for everybody a comfortable window seat. 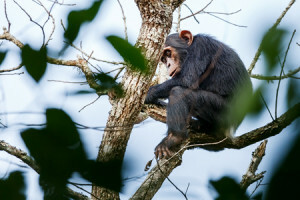 Visit the Chimpanzees (US$ 150, included in the price). Bigodi swamp walk, organized by the local community. A whole day with researchers following the Chimps. It is called the Habituation Experience. Then it is not possible to do the Chimp walk and the Bigodi swamp walk. You have to pay an extra US$ 70 for this activity.